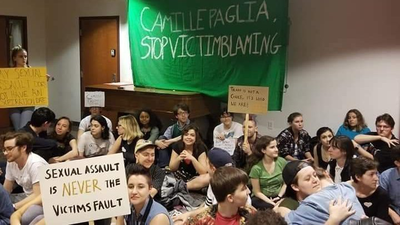 Inept crew who protested Camille Paglia were not able to stop her lecture. Only a few protesters made it into hall. Must have been mystifying for them. Had to listen to her scholarly lecture on Nefertiti’s massive wig crown & 18th Dynasty Egyptian design. Prof Camille Paglia fought for gay rights but she criticizes the radicalism of trans activists today. So students demand she be "removed from faculty & replaced by a queer person of color." No mention of the replacement needing "competency as a teacher." SIGN 👏 THIS 👏 PETITION 👏 “Camille Paglia should be removed from UArts faculty and replaced by a queer person of color.” My suggestions are RuPaul, Tracy Chapman or Jussie Smollett. @JaniceFiamengo Hi, Dr. Fiamengo, there is recently a petition, chng.it/FcYGxVq252 , for the firing of Professor Camille Paglia from the University of the Arts. Would you sign and promote this counter petition chng.it/nMSqcvyfWG in support of Camille and free speech?